It’s On Us is a national awareness campaign designed by the White House to address the issue of sexual assault on college campuses. It’s On Us encourages everyone to make a personal commitment to step up and help prevent sexual assault. Indiana University Bloomington is joining the campaign. And, we want you to get involved too! The Dean of Students office is sponsoring a video competition to increase awareness of the campaign. Students may enter the “It’s On Us” PSA competition as a group, student organization, or as part of a department. Send an email stating your intent to create an It’s On Us video PSA to care@indiana.edu by Wednesday, February 18th. The winning video will be showed during halftime at the March 7th IU vs Michigan basketball game and heavily promoted by IU Communications. The Iris Film Festival takes place at the IU Cinema on January 24, 2015! The Festival is incredibly interested in any and all short moving image works (under 7 minutes) produced in and around Bloomington. The Iris Film Festival is a great opportunity for students and community members to submit their work to a local, competitive film festival with the opportunity to see their films projected in the beautiful IU Cinema. All selected films will also be eligible for a series of awards and prizes at the festival. Submissions have been opened online for the first time! Anyone interested is also welcome to email Russell Sheaffer, this year’s director of the festival, with questions at: rsheaffe@indiana.edu. Second Annual Crimson Film Festival! The Crimson Film Festival is sponsored by Student Cinema Guild and the IU Cinema. It is FREE to submit a film and FREE to attend the event. No rules except the films must be less than 10 minutes in length and must have been made outside of class within the last two years. All submissions are due by November 30th at midnight to indianastudentcinemaguild@gmail.com. For more information about festival rules and film submission, refer to inscg.org. The finale will be held at the IU Cinema on Tuesday, December 9th at 7:00pm. Big prizes will be given to the top filmmakers. With any questions or concerns, students can contact Student Cinema Guild at indianastudentcinemaguild@gmail.com. We look forward to an amazing event to show off some awesome films and hope everyone can come check out the event. Black Public Media has an open call for project funding. They are looking for a non fiction TV series, a scripted, non-fiction web series, and interactive web/digital projects. They are giving away up to $150,000 to fund these pilots! applications for submission must be sent to indianaallmedia@gmail.com with the subject heading IAM Film Fest in order to be considered. However, I will also accept submissions to my personal email, rjfish@indiana.edu, until Sunday, April 27 at 5pm if students mention this email in their submission. Submissions may include any and all film/media projects made by students within the last 2 years, with no minimum time requirement, and a maximum of 10 minutes. Additionally, a $5 application fee will be collected at the day of the screening. More detailed information, along with the official application, can be found here, on our blog: https://indianaallmedia.wordpress.com/2014/04/03/iam-film-fest/. Thank you so much for your time, and we look forward to seeing your work! Here is your chance to win $500 cash and the opportunity to be seen on the #1 internet comedy brand. 2 weeks to make a video and 1 week to get the most views to win! Exciting news for student filmmakers and journalists interested in participating in a high profile project by LabTV with the support of the National Institutes of Health (NIH) and Google. LabTV’s mission is to use video profiles to attract young people, especially women and minorities, to the field of biomedical research. LabTV video profiles of university biomedical lab researchers are being made by student filmmakers and journalists on the same campus as the labs. To lead this effort, LabTV has brought in Emmy award winning filmmaker David Hoffman, with over 50 years of experience and more than 150 PBS specials to his credit. David has created video profile templates with researchers at UC Berkeley and UCSF for students to watch. These templates can be viewed at: http://lab-tv.org/filmmakers/video-profile-templates/. David will be available to work directly with participating student filmmakers and journalists. Learn more about David at www.whoisDavidHoffman.com. We are pleased that Indiana University was selected to participate. 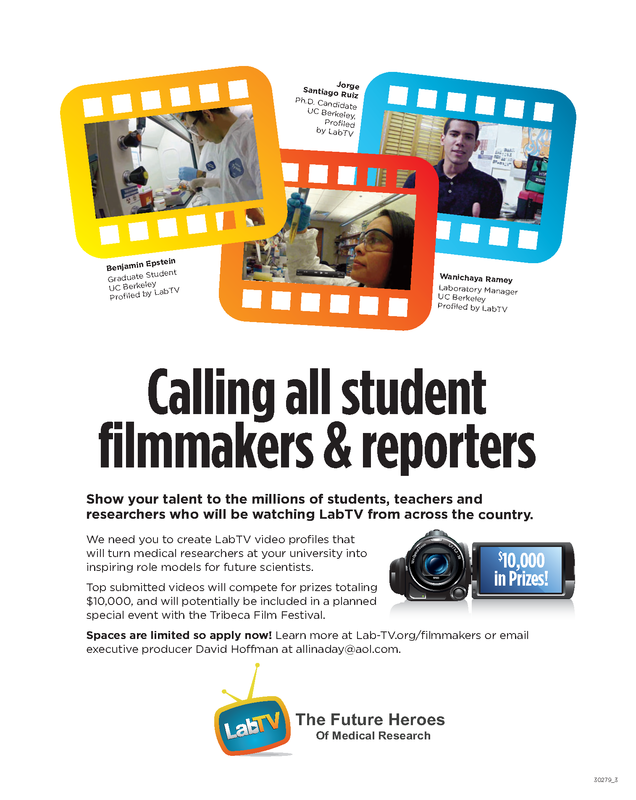 Lab TV is seeking student filmmakers and journalists to create video profiles. The project will only take about a week’s worth of work, which can be spread out over the course of one to two months. This is an opportunity to build an impressive sample reel and have your work showcased as part of a global project that will generate considerable buzz. Additionally, you will have access to LabTV resources and mentoring from David Hoffman. Top submitted videos will be included in a tentative special event with the Tribeca Film Festival around LabTV’s launch in April and LabTV is hosting a competition, where David’s team will be selecting the best videos with prizes totaling $10,000. We recommend that students contact David Hoffman as soon as possible, as spaces are limited. Interested students should complete a short application at: http://lab-tv.org/filmmakers/filmmaker-application. You can also email David Hoffman at allinaday@aol.com if you have any questions about the project. Downloadable guidelines, a production overview, technical requirements and other detailed information are available at www.lab-tv.org. Write an Essay in Your Second Language (Arabic, Chinese, English, French, Russian or Spanish). June 2014 marks the 70th Anniversary of the United Nations and as part of the United Nations Academic Impact global initiative, we are pleased to announce a global essay contest. Winning essayists will be invited to come to New York City for the 2014 Many Languages, One World Global Youth Forum. Accommodations and meals will be provided on the campus of Adelphi University located in Garden City, New York. ELS Educational Services, Inc. (ELS) and the United Nations Academic Impact global initiative are working together to promote multilingualism through the Many Languages, One World Essay Competition and Global Youth Forum. The goal is to promote multilingualism and the continued study of the United Nations’ six official languages: Arabic, Chinese, English, French, Russian and Spanish. To qualify, entries must be in an official language of the United Nations that is not the entrant’s first language or language of instruction in his or her primary or secondary education. “Our collaboration focuses on two of the priorities of the Secretary-General, one being youth and the other multiculturalism, and this is a wonderful way of bringing those two together,” said Peter Launsky-Tieffenthal, Under-Secretary-General for Communications and Public Information of the United Nations, following the signing ceremony launching the contest. “The role of the UN is the role of every global citizen, which is to make peace and to look at ways to enhance the qualities of life, health, and spiritual fulfillment of peoples around the world through common understanding achieved through dialogue, through a language spoken in common,” said Mark W. Harris, CEO and President of ELS,who will provide sponsorship for the event. Ten winners will be selected for each of the six official UN languages for a total of sixty- those 60 essay competition winners will be invited to New York where they will attend the UN Many Languages, One World Global Youth Forum. ELS will sponsor travel, room and meals for each of the contest winners to come to New York, from June 25-29, 2014 to participate in a conference to discuss principles of the UN Academic Impact and formulate action plans to address global issues. This interaction between speakers of many languages will demonstrate the benefits of multilingualism and multinational collaborative dialogue as part of the United Nations Academic Impact. Essay contest winners will attend a conference at Adelphi University and will present the action plan outcomes of that dialogue at the United Nations Headquarters on June 27th. During the Global Youth Forum each language group will develop an action plan in support of selected principles of the United Nations Academic Impact initiative. The delegates will also have the opportunity to interact with student linguists from the USA and other countries who composed the winning essays. They will stay in student housing and share meals on the Adelphi campus located in lovely Garden City, New York and will also be taken on a tour of New York City. Students 18 years of age and older who are currently enrolled in a full-time program of study at a college or university are eligible to compete to win a place as a delegate to the Conference and Global Youth Forum. The contestants must write their essay in one of the six official languages of the United Nations: Arabic, Chinese, English, French, Russian or Spanish. Entries must be in an official language of the United Nations that is not the entrant’s first language or language of instruction in his or her primary or secondary education. The essay, not to exceed 2000 words, should explore: How multilingual ability advances global citizenship and understanding. The essay should reflect the entrant’s academic, cultural and national context. Each entrant must be sponsored by a faculty member or university official. Upon completion of the reference form, the student will receive an email with information on how to enter and upload their essay to the contest website.